Navathome Australia is recognised by the Royal Yachting Association and Sailing Australia. We provide RYA interactive online theory courses for both sail and power boating. You can complete your RYA theory course at home with course materials that include sections designed for Australia and New Zealand by the RYA. Courses are supported by an RYA qualified instructor, located in Australia, who is an experienced sailor in both Australia and the Mediterranean and is available to assist you if you get stuck. The Day Skipper course will take you through chart work, tides and tide streams, weather and collision regulations, safety and passage planning. It is a course that will build your knowledge significantly and develop your skills in understanding and using paper and electronic charts. Plotter and dividers included. January Special $625 - plotter and dividers extra. Yachtmaster Theory is an advanced course for those planning extended passages by day or night. Day Skipper is a pre requisite. If you do not have your Day Skipper Theory you can do the Yachtmaster fast track which provides an overview of the day skipper syllabus before completing the Yachtmaster course. The Yachtmaster Fastrack is $875. $675 - A Celestial Navigation course. Includes practice tables. Ocean Yachmaster is a celestial navigation and ocean seamanship course. It will take you through the use of the sextant and astronomical tables. Ocean is a course for those with a passion for traditional navigation or for those intending to unde rtake transcontinental blue water passages. This course is delivered by our sister school Navathome. This course deals with navigation using traditional methods for ocean crossings. In addition it provides information on planning an ocean passage and critical elements of safety and ocean weather. Navathome Australia specialise in successful interactive RYA recognised online theory courses for Australia. Over 3000 students have passed our courses with first class results. We will keep working with you until you pass and you can epeat the assessments as often as you need. No hidden costs and no exam or certificate fees. The courses are fun to do while building your knowledge. Fully animated graphics with optional voice over make it a pleasure to learn. 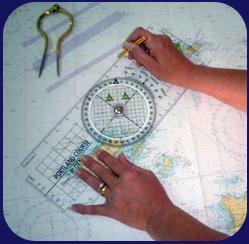 Essential Navigation is an introductory course and is suitable for boating in protected bays. The initial recommended theory course is Day Skipper, followed by the Coastal Yachtmaster theory and finally the Ocean Yachtmaster theory. It's not the price but the quality of the course, the feedback and the help you get that will help you pass your course. We do not run practical courses so your instructors will never be out at sea when you need them. Navathome Australia is the only recognised distance learning provider of Day Skipper and Coastal yachtmaster courses in Australia. Automatic 10% discount on any two Navathome run courses and 15% on three or more in any combination when booked at the same time. Click to hear the optional voice over. Read more? We have solved this problem by using animations and drawings with both text and optional voice over. All our animations have the explanation for each step in clear text so you can, not only read or check back through as many times as you like without having to rewind but, have the text narrated at the touch of a button. There no video lessons in our course. Five days opt out for what ever reason. Free boat handling animations with the Day Skipper and Coastal Yachtmaster. 100% Commitment to helping you qualify with a distinction. Free plotter and brass dividers with all RYA online Day Skipper courses. Six months access with the option to extend as many times as you like until you pass your assessment. Two years access to the lessons after you have passed your course. More content than the standard RYA courses e.g. free interactive radar simulator, interactive quizzes and animations. Proven success rate 10 years experience of online teaching has taught us how to teach online. We are so confident in our courses we offer a five day opt out no matter what the reason. Simply return the RYA pack undamaged and we will refund your course fees in full. Automatic discount of 10% on two courses. Courses for groups or individuals will qualify. Your assessment can be taken on line and in the comfort of your own home. Your results are provided instantly then followed up by feedback from your instructor. There is no frustrating waiting around to find out how you have done. If you require your certificate for MCA commercial purposes it will need to be invigilated by a training centre. Please contact us for details. This will incur an extra fee. Copyright © 2010-2019Navathome.com.au. Navathome Australia is a family business based in Bunbury, Western Australia. The School Principal is Don Punch who is an RYA Yachtmaster instructor and has a Master Class 5 for power and sail.